Are you happy you got a B.A.? After four long years of labouring through lectures, slogging through Scantron sheets, and campaigning to stand out from the crowd, you've finally got your highly sought-out Bachelor of Arts degree. Was it everything that you've dreamed of, a mere stepping stone to a more practical college degree, or worse... the gateway to a part-time job in retail? Much discussion has recently emerged on the declining value of the increasingly ubiquitous arts degree and whether - with a tight job market and Gen Y struggling to land meaningful employment - the system still has relevance. Two articles in today's Globe and Mail, "When a university degree just isn't enough" by James Bradshaw and "Wanted: clear thinking on educating the work force" by Gwyn Morgan, both highlight areas within the post-secondary educational system that need to be improved. In this post, I'll highlight three reasons why the B.A. is broken, and offer a POV on how it can be fixed. "The more young people who get degrees, we’re told, the better off society will be. Higher education – the more the better – is critical to Canada’s future, because it will make us more competitive and more prosperous... Just one problem. Our universities admit too many people, not too few." In the book "Campus Confidential", Ken Coates and Bill Morrison argue that universities are full of people that probably shouldn't be there: “They and their parents have bought the mantra: Go to university, get a degree, then get a white-collar career." The result of the humble B.A. 's ubiquity and its non-discerning nature is that it's no longer viewed as valuable. As Bradshaw writes: "As the degree became common, employers grew hungrier for students trained with specific skills and ever-more-advanced degrees." So there you have it. We've come a long way from the time when an arts degree represented the pursuit of the elite - learned men and women who were wealthy enough to spend their time reading the Classics, debating philosophy, and exercising their minds by exploring how the world works. These days, the pursuit of a B.A. is the pursuit of the masses, the common man, and this shift has resulted in its loss of value. From a purely educational standpoint, the spread of the B.A. should mean that more and more students are being trained to be smarter, highly-functioning critical thinkers, right? Wrong. 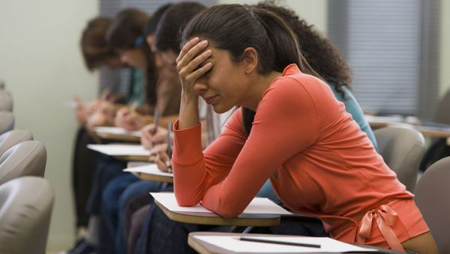 In order to handle the bloated number of undergraduate students (between 45 and 75 percent of first-year classes at mid and large-size universities have over 100 students, according to Higher Education Strategy Associates), many universities have had to rely on grading systems that require little to no thinking. 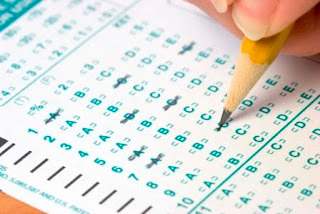 Pure multiple choice exams (complemented with the much reviled Scantron answer sheet system) have become the easy way out for many professors, with the Scantron machine spitting out grades in mere minutes. Contrary to the university ideal of classrooms that serve as forums for discussions and debates with both professors and classmates, classes (now commonly referred to as one-way "lectures") have become impersonal and non-collaborative. "The BA, of course, has never been all about employability, but was praised for its inherent value in broadening and challenging young minds," Bradshaw writes, "but even that goal has been impacted by large and impersonal lecture-style classes, with little access to busy professors." The end result of a broken learning system is that the B.A. is no longer producing the kind of educated and opinionated individuals that it's meant to. It's churning out zombies - unmotivated, memorizing machines who aren't benefiting from the process of higher learning. "As most employers will attest, a BA degree no longer certifies that the holder will be able to read, write or communicate," writes Wente, "and many (if not most) undergraduates are not interested in the material they’re studying." What, then, results from having a large number of B.A.-toting graduates that never truly learned how to think critically and apply that knowledge to real-world problems? A giant hole in the job market... that's what. "The technological sophistication of everything we do is increasing dramatically," argues James Knight, the President of the Association of Canadian Community Colleges, "[T]his being the case, we need people with higher skill levels." B.A. graduates are entering the workforce with neither the liberal arts-style education that will help them solve complex problems in the real world, nor the specific technical skills that employers are looking for. The skill-set disparity has had a huge effect on the perceived value that the investment of time and money into a B.A. will provide (and this negative perception likely increases the further along someone is in their degree, unfortunately). As Wente explains: "The return on investment for a general undergraduate degree has fallen sharply. What Canada really needs are people with trade and technical skills. There’s enormous demand for medical professionals, certain engineers, IT technicians, millwrights, plumbers and electricians – but not so much for BAs in sociology. Our graduates are mismatched to the job market." As a result of this, the B.A. has slowly become accepted as a stepping stone towards further training and education, a mere check mark on the To Do List that leads to a career. When post-graduate degrees and college certificate programs end up providing more value in the eyes of students than a four year university degree, you've got a problem. How can a degree that everyone has possibly increase its value? Simple: get rid of the degree. A B.A. on its own has become too generic to be meaningful - it doesn't do a good job of highlighting the skill-sets that are actually gained with a liberal arts education. At the same time, traditional, topical streams within the B.A., like sociology, psychology, and history, don't do a good job of selling skill-sets, either. What's the point in majoring in history unless you're going to become a history professor, right? So why not abolish both the generic designation and the topical majors and minors. Why not segment the B.A. into skill-oriented streams that aim to build and develop valuable abilities like critical thinking, analysis and research, persuasive writing, ideation, human empathy and understanding, and more. Liberal arts students could then choose from a range of courses, topics, and tutorials that help them build up the skills in their chosen streams. No philosophy graduates here, just expert thinkers. Imagine a BCA (Bachelor of Critical Thinking) or a BHU (Bachelor of Human Understanding). Not only does the value of such degrees become much more apparent to both the student and their prospective employer, the sheer range and variety of degree segments (and the increased scarcity that a segmented degree would have - ie. not everyone will have a Bachelor of Ideation) will automatically make them more valuable to graduates. Suddenly, their education has become differentiated. In the New Media world - where ideas are crowdsourced, articles and videos are commented on and debated, and where people from a wide range of places and backgrounds work together to reach a common objective - does the two-hour lecture even have a place? No... so get rid of it. Eliminate the Monday afternoon lectures and instead invite students to break off into groups and actually participate in discussions with each other. Provide them with the tools and the material to learn things on their own, but emphasize their interactions, discussions, and debates more than anything. Professors should no longer think of themselves as "Professors" at all, but rather "Moderators" tasked with facilitating discussions and higher-learning, whether offline or on. Their job isn't to provide a vocal take on that week's chapter, but rather provide and invoke critical thinking on a range of topics covered within a course. Using online message boards and collaboration tools, they can interact with students on an ongoing basis - beyond the two hour lecture and morning office hours, embracing the idea of 24/7 learning. Memorization should be frowned upon. Not enough Professors, you say? T.A. 's who are working to rule? Then why not empower your more experienced third and fourth-year students to take on the role of mentors and guides for those in earlier years? Allow students to increase their own learning and understanding by pushing them to explain concepts and arguments to those that are younger than them. Encourage students to host impromptu group discussions among freshmen and let them work through their assignments and essays together. If segmented degrees that build up specific liberal arts skills and a collaborative learning environment isn't enough to keep potential employers happy, then the B.A. should provide some added-value that would do just that: College-like applications and mini-programs. Rather than simply offering a Co-op placement (which simply sends students into a workplace to learn) or partnering with a college (which again just sends students out of university to learn practical skills), why not strive to bring more of those practical and specific real-0world skills into the university? Segmented B.A. streams could include mandatory "real-world application" courses, training sessions, and workshops that seek to build connections between the ideas and talents that are developed by a liberal arts education and the specific technical skills that are sought-out in the real world. As students approach their final years, these college-like courses should become more prominent, and force undergraduates to learn how to apply what they've learned in real-life situations and contexts. What do you think about the B.A. system - is it indeed broken? What other solutions can you think of that could help fix it?